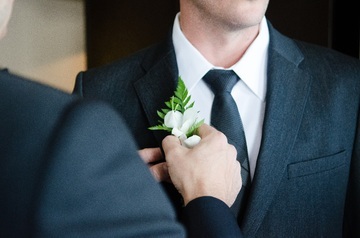 Whether you’re best man or one of the groomsmen, you are probably under instruction from the groom (who’s under instruction from the bride) to look presentable on the big day. You’ve managed to sort your suit and your shoes with no trouble and you’re sure you look the part from the neck down. But what about your facial hair? To shave or not to shave? Stubble, clean shaven or manly beard? Do you play it safe and stick with the style you’ve had your whole life or do you try something new? It’s all a bit overwhelming. I’ve teamed up with Trendhim to talk about how you can get your facial hair looking great, no matter what the style, on the big day. For you beardies, things are quite simple. You’ve probably put a lot of effort into growing and maintaining your beard that by now you are a master of your own facial hair and you know what does and doesn’t work. The only advice I would give here is to trim your beard on the morning of the wedding with some specialised beard scissors so it looks as even and as neat as possible. You may also want to give the edges a little shave to make sure they are as sharp as possible. If you don’t already use some kind of beard product, then maybe consider incorporating one into your routine before the wedding. Balms and oils can make your beard look extra healthy which is something that won’t go unnoticed on the day or in the photos. Moustaches are a tricky subject. Being a member of the wedding party, you should consider the bride and groom’s opinions. This means that you shouldn’t decide to grow an elaborate handlebar moustache without getting the go ahead. It might sound ridiculous but some brides can be particular about certain things, like moustaches, throwing off the overall look of the group together in the photos. Another reason to carefully consider a decision to grow a moustache is whether you will look back on the photos in 20 years’ time and say “what was I thinking?”. If you’re unsure about how your moustache will stand the test of time, then maybe consider going for a timeless style. A pre-wedding shave can be a great group activity to include on the morning of the wedding as it will calm the groom’s nerves and get everyone looking polished. This doesn’t have to be done by a professional, as there are now easy ways you can achieve a barber-shop style shave from home. One tool you can use to get a close and high-quality shave is a safety razor. These are similar in style to your typical disposable razors, except they only feature one blade. Contrary to what many adverts tell you, a singular blade actually gives you a better shave because it reduces irritation and lowers the chance of ingrown hairs and shaving rash. They are also really easy to use, even if you are a beginner, so they are a great option if you don’t want to have to learn a new skill. If you’re feeling a little more adventurous then you could branch out and choose a straight razor. These take a little more practice, but the results you get from using them are unmatched. Even if you don’t fancy getting a new razor, a simple way to make your shave feel a little more special and luxurious is by using a shaving brush. These brushes are designed to create a proper lather and spread it evenly across your face. One of these could make for a really nice gift to the groom on the morning of the wedding as many claims that they make the whole shave experience more relaxing and therapeutic. Whatever you choose to shave with and whichever tools you use, be sure to start and finish your shave the right way. Begin with either a hot shower or applying a hot cloth to your face to suitably open your pores and soften the hairs and then apply a high-quality shaving soap or cream. End by using some kind of post-shave balm or lotion to reduce irritation and make sure your skin is looking its best for the big day ahead!